Peel oranges and bananas. Hull strawberries and slice peaches and remove the pits. Cut up the fruit (except grapes) into ¾ inch size pieces and toss into a bowl. Squeeze a few drops of fresh lemon onto the fruit. Mix the fruit together in a bowl and add walnuts. Add the milk, honey and cardamom. Mix and refrigerate. Always keep a shaker of kelp on the table. It’s available at health food stores, buy a little at a time, there are different varieties, some varieties tastier than others. Kelp is loaded with trace minerals and vitamins. Due to kelp’s iodine content, it is reputed to be advantageous in the event of exposure to radiation. I love crusty French bread but that is absolutely, positively not what the ancients meant when they said bread is the staff of life. They took the wheat berries and soaked them in warm water until they began to sprout then they ground them and shaped them into a loaf and steamed them. You can make this bread too and it will improve your health by leaps and bounds if you eat it instead of white bread. You can also add raisins and nuts to it before steaming it. You could put olives in it, etc. It really is tasty. I used to make it by grinding the sprouted wheat berries in an old meat grinder but now I’ve found if I get the blender going first, then throw the wheat berries into the little hole at the top, it works. But be careful, they come flying back out again; they could hit you in the eye if you weren’t careful. After they’re ground, they will shape into a loaf that you can put on a plate. Don’t try steaming in the oven; I think that may dry them out. Elevate the plate over water in a kettle, then cover it and steam for 5 or 10 minutes. Let it cool then keep it wrapped in plastic. Don’t let it dry out. An Apple a Day Keeps the Doctor Away? Really? When I first got together with my husband he had us go on an “apple diet”. But it wasn’t entirely apples, he allowed us to eat a little raw cabbage as well. It didn’t last very long, probably just a day and a half and after we were through we smelled like apples. It wasn’t too big a deal for me because I’d been enjoying apples from the trees I found out in the woods and eating quite a bit of them because they were so pretty and fresh, I was young and believed that if I ate something so pretty and fresh right off the tree, I couldn’t help but look that way too. Now days, I still eat fresh apples but just one at a time, sometimes only three apples a week. But I noticed that when I’m craving something, anything, whether it feels like I need protein or sugar, that apple really hits the spot. Suellen Ocean is the author of Gold River available at Amazon. If you’re a gardener like I am, you may be a tad exhausted after months of soil preparation, weeding, watering and harvesting but the end of summer is not the time to shrug and let the garden go. Keep watering, weeding and if necessary fertilizing. You’ll get a lot more produce that way, which is what you planted it for. Right? There’s nothing like going out into the garden and picking fresh vegetables and grabbing a few handfuls of fresh strawberries. It helps me bond with my surroundings. I feel uncomfortable when I am too busy to keep my garden to my standards (which aren’t THAT high, I’m a funky gardener). Uncomfortable because a garden sustains me physically and spiritually, it literally feeds me in those two ways. Whether it is one solo tomato plant or an acre of corn, those of us who put a seed into the ground and nurture it, feel a special bond with our surroundings, a grounding so to speak. No pun intended. 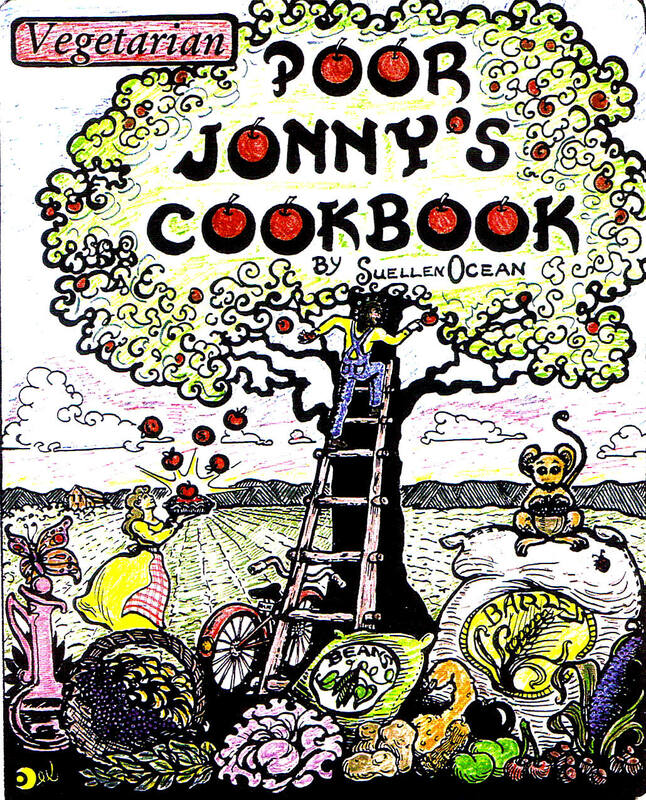 Suellen Ocean is the author of Poor Jonny’s Cookbook. Try over baked potatoes or as a salad dressing or dip for a fresh vegetable plate that has zucchini slices, carrot sticks, cherry tomatoes, cucumbers and crackers. To the yogurt add lemon juice, oil, garlic, salt & pepper, mixing well. This soup is not cooked. It is “warmed” just enough to soften the snow peas. Mix above ingredients and heat. Cover and let sit one hour. 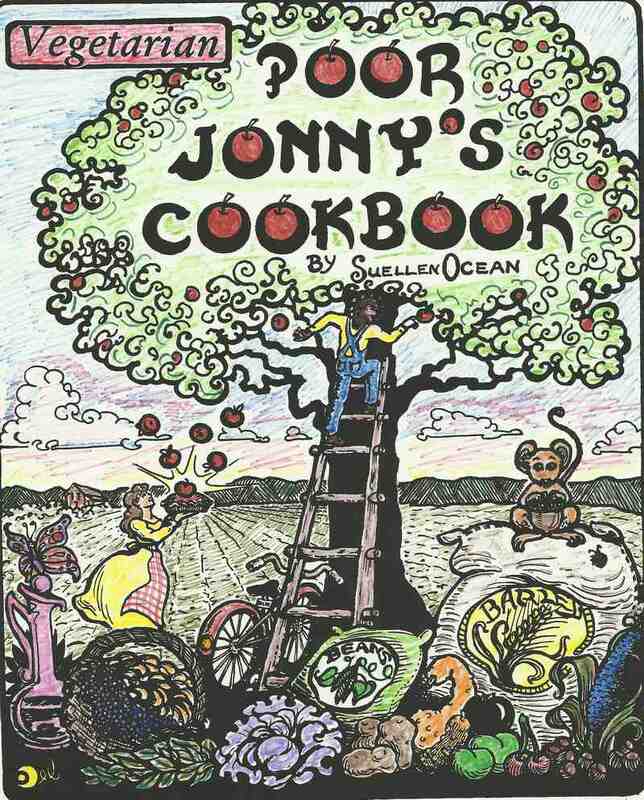 Serve with sprouted wheat berry bread. Refrigerate to develop and merge flavors.